Some people love it, some people hate it – and that’s not just the show, it is also this new spin on a slot game by Random Logic. Indeed, many of the moves made may seem a bit random, but lovers of the show should enjoy this extravaganza, filmed in front of a live studio audience for your spinning pleasure! Have You Got The X Factor Slot Review? The X Factor is a world-wide phenomenon, brought to us by the high-waisted trouser wearing Mr Simon Cowell himself. Spanning the UK, US, Australia, South Africa and a whole host of other countries in other languages, the X marks a spot we all know and love to watch. 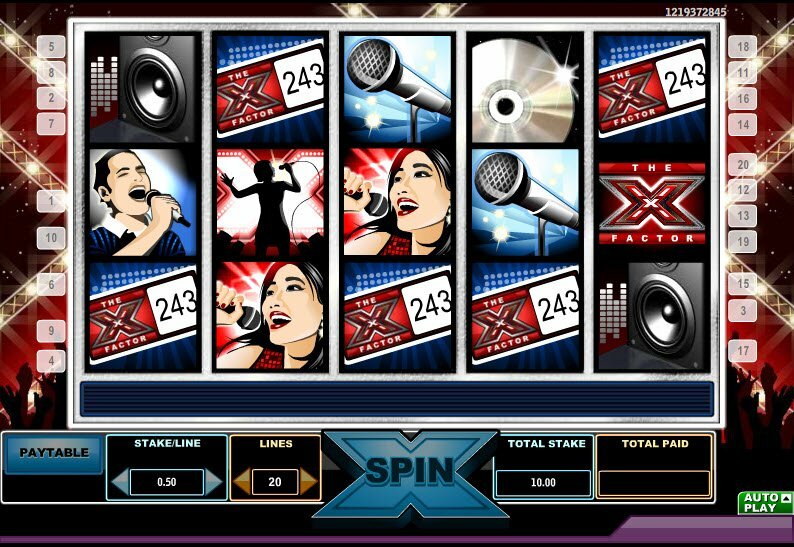 And now here it is as The X Factor slot, for our reel spinning enjoyment. We dive right in to the auditions. With the ever present X Factor symbol that strikes terror into the hearts of all who sing before it and the panel. There's a shiny haired girl, microphone in hand, singing her dreams and a speaker, worth much fewer coins than the microphone itself, worth 5,000 if you manage to spin them on all 5-reels. Moving on, we see a bright young spark of a man warbling into his hand held microphone and a silhouette of someone wearing a skirt standing in front of the crowds. I cannot say if it is a woman for sure as, there are many tricks popstar wannabes will use to get famous on The X Factor slot reels of fame. There's an audience ticket, worth 500 coins if you manage to spin them visible on all 5 reels, and a shiny CD coming in at 1,000 coins for 5 - perhaps worth so much for the novelty factor, as we know everyone downloads in this day and age and uses MP3's or smartphones! 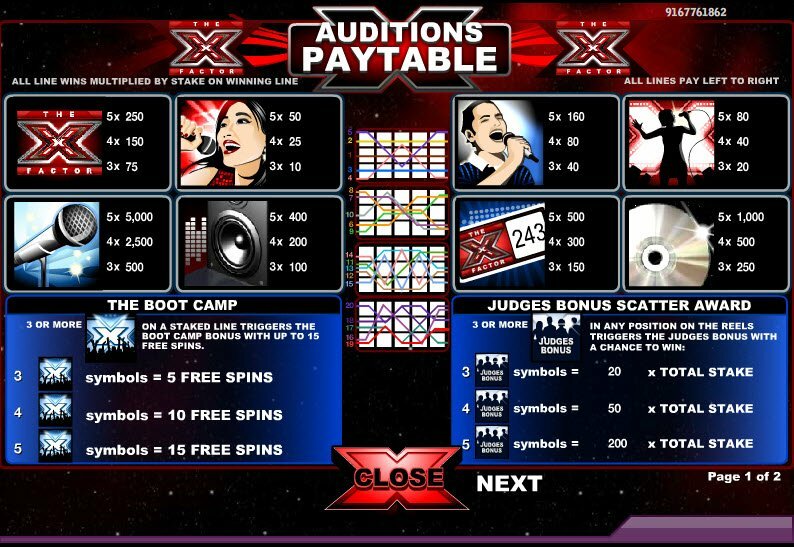 An enormously nifty feature is if you make it through to boot camp, all The X Factor symbols will become worth much, much more - the rising price of stardom. 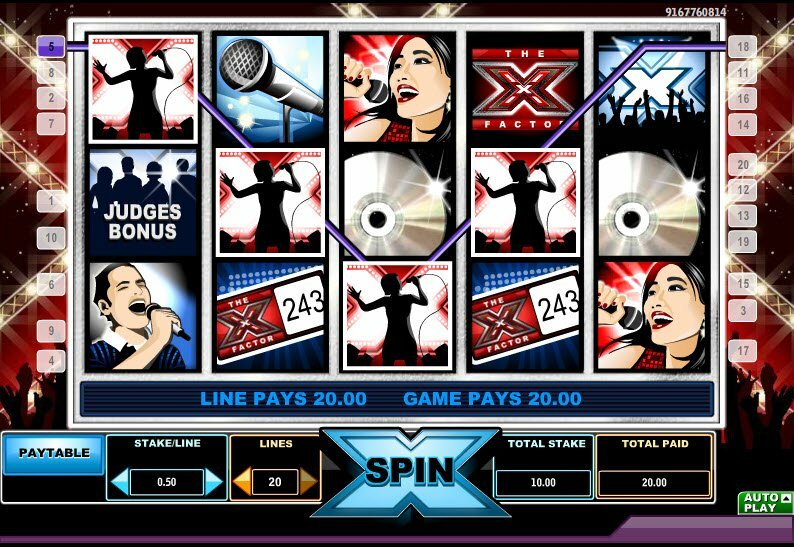 The X Factor slot boot camp silvery X behind a silhouetted crowd will get you your free spins, the more reels taken up with these symbols, the more free spins you get, up to a decent 15. Then there is The X Factor slot bonus judges scatter award where the looming judges will multiply your stake up to 200 times! Last, but most certainly not least, is The X Factor slot live final, a silver star that, if collected during the boot camp, will advance you to the glittering stage of the live final where you dreams may just come true! What’s In Grandmas Attic Slot Review?